PLACE Blog: Connecting Places Mini Series: Bicycling Belfast: Part 3: Belfast - a bicycle city in the making? The 'Building an Active Travel Future for Northern Ireland' consultation document, published by DRD in December 2011 (consultation runs until 9th March 2012) has provisionally placed a target of increasing levels of cycling from 1% to 'match our UK counterparts' by 2020. Not only is this target highly unambitious (currently an increase to 2%), but it would also be a moveable target - dependent on how our UK counterparts fair, making the allocation of appropriate levels of investment almost impossible to work out. The consultation document also fails to fully recognise the difference between rural and urban areas in NI. Increasing levels of active travel in rural areas will be a tough task given the low density of development and distance to services. However, particularly in Belfast, where, as shown in part one of this series, we have a high level of access to services, doubling the share of cycling trips to 2% would be achievable in a very short time frame, given proper investment. Perhaps separate targets need to be set by local councils in accordance with their rural/urban status. As shown above, Great Britain has the second lowest share of journeys made by bicycle in the EU. Why should we in Northern Ireland set the yard-post for success at GB levels, who, by all accounts, are a failure in active travel terms? Surely, as mentioned within the document, we need to be looking to those countries who have been successful in raising modal share of cycling and setting a goal of reaching those levels. We needn't look too far afield for ambitious, and realisable, targets, both Ireland and Scotland have set goals of 10% by 2020. In an effort to highlight just what needs to be done in Belfast the remainder of this post will give an overview of what our current system looks like and what might be needed to improve uptake of cycling. Currently Belfast’s cycle network is made up of a variety of cycle lanes and other associated infrastructure. However, as shown, the network is far from cohesive and this is somewhat illustrative of the lack of any real strategic approach taken to date, despite rhetoric indicating otherwise. There is a distinct lack of any high quality and continuous links from the suburbs into the city centre, with the notable exception of the Lagan Cycle Path serving South Belfast. There are, however, good elements of this network which, if replicated elsewhere, would significantly improve the appeal of cycling in the city. Likewise there are also pieces of infrastructure that are lacking in quality and we need to ensure that these mistakes are not repeated. For the most part Belfast’s cycle lane network is made up of shared Bus/Cycle lanes. With some exceptions the majority of these lanes are in operation between rush hour times, approx. 8am-930am for city centre bound lanes and approx. 4-6pm for outbound lanes. Outside of these hours they are primarily used for car parking or, in some cases, as informal taxi ranks. Not only does this limit the efficiency of Metro services but it also creates difficulty for cyclists using the lanes outside of 'operational hours' as they are precariously left between stationary cars and moving traffic and firmly within the ‘door opening zone’. The reality is that the majority of Belfast's cycling lanes are unusable for the larger part of the day and, when in operation, sharing the space with one of the largest vehicles on the road is less than welcoming, for cyclists and bus drivers alike. This style of shared lane may be an easy space saving solution for Roads Engineers, but they are certainly not the most convenient for cyclists and are definitely not the way to make cycling safe and inviting for everyone. Many junctions across the city have now been fitted out with ‘advanced stop lines’ or ‘bike boxes’. The objective of these is essentially to allow cyclists to get a head start at the lights, move off safely and to allow car drivers to anticipate cyclists movement. This type of infrastructure is a common feature of many cities cycling infrastructure. However, a large number of these bike boxes do not have sufficient space before the box to actually access them, beyond a token deviation, as shown in the picture above. Getting caught out filtering towards the bike box between the curb and a row of cars or between two lanes of traffic as the lights change can be a dangerous situation for bicyclists to find themselves. Both the Lagan pathway and the Comber Greenway have proven to be popular cycle routes, each providing a traffic free environment for pedestrians and cyclists alike. While the section of the Lagan Path between Albertbridge Rd and Ormeau road is busy spot for commuters, outside of this these pieces of infrastructure are predominantly orientated towards recreational cyclists. The recently announced, and welcomed, extension of the Comber Greenway seeks to increase access to the Titanic Quarter from East Belfast, without the need of a car. However, it must be remembered that, despite the success of these routes, they are only two corridors which serve a small section of South and East Belfast respectively. Both of these routes are well used and enjoyed, however, if we are to truly make an impact on cycling levels in the City we can't let these be distractions from the real need in Belfast - space on the road for bicycles. We should learn form the successes and limitations of these routes and incorporate this learning into providing on-street infrastructure in the city. These lanes, as shown in the second post of this series, are commonplace within many cities in Europe and further afield. Currently, in Belfast, they are somewhat few and far between and remain something of a symbolic gesture, allowed where they are not going to cause too much disruption to general car movements. The benefit of these lanes are clear - uninterrupted cycling, free from parked cars and segregated from both traffic and pedestrians. Thankfully, however, it would appear that more are on the way for the city centre as part of the next phase of Belfast on the Move. However, this phase only represents 238.5m of the proposed 1km of dedicated cycle lanes in the city centre. Real questions need to be asked of this figure. Is 1km really enough? Given the large scale nature of many of the roads in the city centre, much more could be done. The dashed line - the quintessential symbol of permeable space - says it all. Cyclists already know to keep left where possible and these lanes do not give any priority to bike riders, so what is their purpose? Quite possibly they have been implemented just to add to the tally of km of cycle lanes in the city because, in reality, they serve little other cause. Possibly the next step for cycling infrastructure in Belfast is to make a real effort at tackling junctions such as the one pictured above (Newtownards Rd/Bridge End). The majority of bicycle related collisions occur at junctions, which is one of the reasons we have started to see bike boxes at traffic lights. However, the lack of ambition shown in the picture above is commonplace when the going gets tough for our roads engineers. In comparison to our European counterparts, our roads in Belfast are relatively small. As such, providing dedicated and segregated lanes everywhere will not be possible. If we are serious about improving levels of cycling here, we need to move beyond the perception, as wonderful as it would be, that Belfast will someday be covered with Copenhagen style lanes. We need to try another tact. Other measures such as 20mph zones in built up areas where there is not enough space for adequate lanes and improving priority at traffic lights and junctions for cyclists could prove very influential in increasing safety on our streets and, as will be discussed tomorrow, could have potential economic benefits areas like the Lower Newtownards Road. 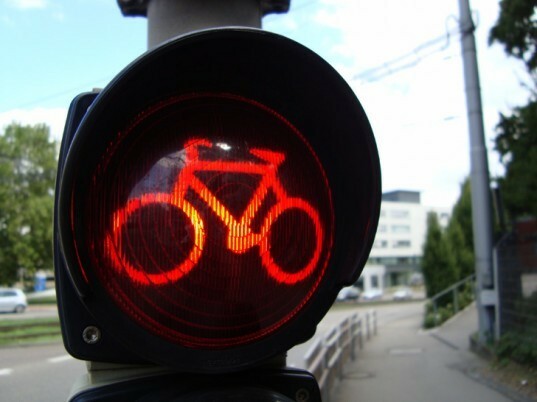 Recently it was announced in that cyclists in Paris will be allowed to run red lights at certain junctions. The theory behind this move is much the same as that for bike boxes - it allows cyclists to get away from the lights before the cars and stops cyclists bunching up, slowing traffic. It also makes cycling easier, ensuring cyclists can carry through valuable momentum. However, those choosing to take advantage of this new law will take on full responsibility in the event of an accident. While it may sound absurd for this to be introduced within a Belfast context, if you think how many intersections in the city have a pedestrian crossing phase extending on all sides (i.e 4 sets of 'green men' at the same time with all traffic stopped), an opportunity to improve cycling conditions may exist. Naturally pedestrians would have full priority, but there is little need for cyclists to stop during this phase of the lights. Again if we look back to part 2 of these series, this style of experimentation plays a vital role in making cities more bicycle friendly. At present the focus of cycling in Belfast is as recreation, not as a viable means of day to day transport. While routes such as the Lagan Towpath and Comber Greenway are successful, it is the ability to safely travel on our roads that needs to be the focus of future investment. Should we not invest strategically in dedicated and safe cycling paths along our arterial routes as a starting point (similar to London’s growing cycle ‘superhighways’) rather than wasting money on piecemeal and ad hoc ‘improvements’ in the hope that one day something that resembles a network will form? Belfast does have the potential to become a cycling city but to akin the city at present to Amsterdam would be to do Amsterdam a disservice. As demonstrated with NYC and Dublin, only with ambitious and achievable targets enshrined in legislation can our potential be realised. What ideas do you have to improve cycling in Belfast? What are your views on the proposed DRD Active Travel 2020 targets? What are your favourite and least favourite pieces of cycling infrastructure here? Tweet us your pictures and stories using #bicyclingbelfast. I think the green boxes are useless: Cars always sit in them, and as you mention cyclists are encouraged to get 'caught out' in compromising places. The cobble strips on the Lagan cycle path are annoying as hell. There are places where the cycle lanes end dangerously... clearly nobody has actually thought about what each road user is doing at these points: areas along the outer ring spring to mind (remember it's not all about getting in or out of the city, but around it), and my favourite, coming down past Central Station turning left towards Ormeau... the cycle lane just ends half way around the corner into a tight car lane. Cars think you are in your own space and suddenly you are sharing... and just looking at the angles/line of sight considering driver-> windscreen pillar -> cyclist on the bend makes you wonder if it would be possible to make it more dangerous. I think the 'run red' idea is good, but it does need to be the cyclist's responsibility, and pedestrians must always have right of way. I generally don't advocate it and see some stupid dangerous moves, but I do use 'turn-left' situations quite a bit and will move off/continue at clear pedestrian crossings to keep momentum or clear obstacles before the cars catch me. Generally, I am happier taking a lane, and having to use a borrowed old mountain-bike for 2 weeks that was too small and very slow compared to my usual steed, I still had no additional problems with traffic. Currently, to be safe... confidence and looking out for yourself work best no matter what you ride. It may appear we want to have our cake and eat it by acting like a car one minute and pulling a sneaky move the next, but it's not the bicycles' fault that it is capable of being successfully used in a wider manner of ways than a larger vehicle that is restricted by size, manoeuverability, connection to the environment, and potential consequence of errors. I avoid that area of Ormeau like the plague, nearly got hit there by a rather aggressive driver. Annoying though because the alternative is the Lagan which I'm not a big fan of - cobbles on a 20+ year old bike are horrendous! The red light thing potentially sounds a lot more dangerous that it actually is. Wouldn't necessarily advocate it city wide, but the likes of those junctions i mentioned it could be more easily implemented without the same risks. I take your point re confidence, however the reality is the majority of people are not confident in traffic and the trial and error approach isn't going to appeal to most. How we tackle this is up for debate. Easy to say hard to implement is the segregated lanes/better infrastructure. Or do we need to go back to basics, back to schools, get kids out on the roads and build that confidence at an early age? Opening this up for wider debate - anyone? Strict liability is what we need. Stronger laws, tougher penalties for killing or seriously injuring cyclists and pedestrians with motor vehicles. I've lost count of the number of court cases I've read about now where a driver kills or injures someone but the judge lets them off or shortens their ban because it would mean they'd lose their job. It goes all the way to the top, people in NI see driving as a right, rather than a privilege. Cycling is widely seen as an activity for kids and those who can't afford a car. Cyclists are seen by drivers (if they're lucky!) as a nuisance. I don't know how bad congestion would have to get for a significant number of motorists to consider an alternative. The Green Bicycle Company supports cycling as a healthy, economical and environmentally conscious lifestyle. At our workshop we transform unwanted bicycles into safe, affordable products, while also providing a comprehensive maintenance and repair service. Seeing the large number of unwanted bikes being thrown out we decided to try and prevent these from ending up in landfill sites.. If you have an old rusting bicycle that you no longer require if its taking up space , and you have no way of taking it to the dump call us we will take it away for you..if you have outgrown it or you want to sell it also call us we will pay you for it. In comparison to our European counterparts, our roads in Belfast are relatively small. As such, providing dedicated and segregated lanes everywhere will not be possible. If we are serious about improving levels of cycling here, we need to move beyond the perception, as wonderful as it would be, that Belfast will someday be covered with Copenhagen style lanes. That is NOT TRUE. After living in Amsterdam for 3 years (what with much of downtown Amsterdam dating from the 16th century) - no doubt it was harder for the Dutch to enforce the segregated cycle lanes in Amsterdam at first but they ended up closing off several roads, turning many two-way roads into one-way road (they started way back in the 1970s) and its enshrined in their laws that roads must be more cycle friendly etc. If it is possible in Amsterdam, then no reason why we can't have segregated cycle lanes in Belfast.